We've been around since early 2012. Starting with leaflet drops to neighborhoods about our services. From there, we went from strength to strength and now have the equipment to deal with even the biggest of cleanups! We are also better in terms of service. We will dismantle, take away and recycle for you. You don't need to lift a finger... Plus it being cheaper than a skip, its a no brainer. Getting quotes from different companies for your waste? We WILL match any quote you get if ours isn't initially the lowest! 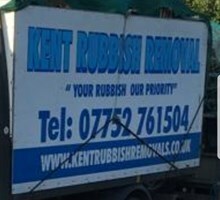 Kent based rubbish clearance waiting for your inquiry. Contact us to get your mess cleared. We have teams throughout Kent awaiting you. We enjoy the satisfaction of clearing even the most challenging of cleanups. Our Kent based rubbish removal teams love their work!